Plymouth B&B - Citadel House Hotel and Guest House offers excellent Bed and Breakfast accommodation. Located on Plymouth Hoe and only a short stroll to the city centre, sea front, the Barbican, Brittany Ferries, Pavilions Leisure Centre, Theatre Royal, National Marine Aquarium, University of Plymouth, Mayflower steps and less than an hour's drive to the world famous Eden Project this is truly an ideal location. Citadel House is a friendly, relaxed, stylish guesthouse with most rooms en-suite offering comfortable clean accommodation at very competitive rates. See how easy it is to book direct for the best price on 01752 661712. We serve an excellent breakfast and we are happy to provide vegetarian food or indeed any special dietary requirements. We have four double bedrooms with en-suite shower rooms, each decorated in a modern style.The comfy beds all have crisp, white cotton sheets with duvet. We have four twin bedrooms with en-suite shower rooms, each decorated in a modern style.The comfy beds all have crisp, white cotton sheets with duvet. 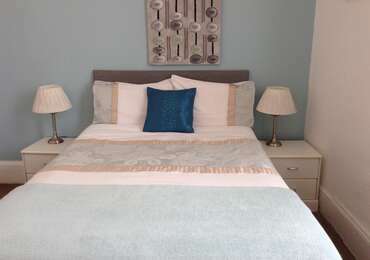 A lovely, spacious family bedroom with en-suite shower room.This room has a double bed and two single beds, all with crisp, white cotton sheets with duvets;decorated in a modern, tasteful style.